Eight years ago on this very date, Hillary Clinton gave a different kind of speech, suspending her razor close race for the nomination and congratulating Barack Obama, the eventual nominee. That day, she dressed in black, perhaps out of respect to her supporters mourning the loss. But tonight, she was a picture of rebirth and hope, as she once again crossed a milestone for all women. Media outlets may try to underplay it, but her achievement, and that of her campaign volunteers, staff and supporters is something deserving of celebration, overcoming a constant media firestorm and 25 years of Republican bashing to once again earn more popular votes than any candidate of either Party. Women need to get the message that they can earn a seat at the biggest table. In order to do that the achievement of role models who come before them must never be rendered invisible. 44 years ago this week, Shirley Chisholm became the first woman to win the NJ Democratic Primary. * In 2008, Hillary won 22 states and 18,000,000 votes. Tonight, Hillary was voted our Democratic Nominee. As a longtime Hillary supporter, I was proud to cast my vote for her today. I must have checked the ink dot I marked on my ballot three times before daring to move to the next page. Emotion overtook me as I watched her speak, confident not only in her leadership and policy prescriptions but in the outreach I’m sure she will do, both to Senator Sanders’ loyal supporters and to crossover voters of any and all political persuasions. My face just cracks into a giant grin looking at Hillary right now. That is the face of a woman who WORKED for it. As a trailblazer, This is yet another in a series of Hillary Clinton firsts, but as she made clear, this victory is about all of us winning together. No matter Hillary’s brand recognition, which works to her detriment as often as it works in her favor, never doubt the enormity of today’s achievement. Have a glass of wine, everybody. Then tomorrow, back to work! Anita, you and I along with millions of other women have been waiting for this day to come for 8 long years. The day has finally arrived! I cried and cheered last night for Hillary. I see who she is and never believed the media’s attacks about her. No one who has achieved so much for so many people cannot be the person they claim her to be. It still saddens me to see how gently Bernie is being treated by the DNC and the media. He lost and no one is telling him to get out of the race. He and his supporters think it is honorable to hold the democratic party and more importantly, Hillary, hostage to his demands. No one gave Hillary the same respect when she won the popular vote and was much closer in pledged delegates than Bernie. Despite her extraordinary achievement, fighting against Sanders and Trump and the media and still coming out on top, she is still expected to be the “nice girl” and let the boys save face and make her campaign imminently more difficult because he cannot gracefully exit and do what he said he was going to do — support the democratic nominee and defeat trump. Hillary said last night in her speech, that you cannot be great and be small. sanders just proved that he is not great because he is acting so small in the face of a defeat that was won fair and square by Hillary. Clearly, we are still having to put up with the last “ism” which is just as wrong as racism. 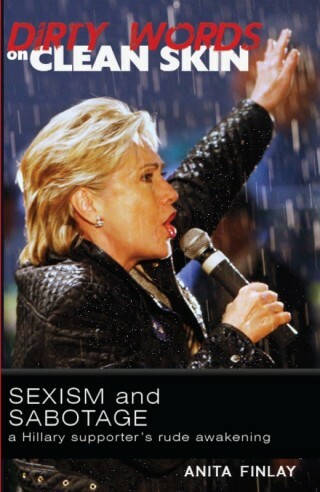 Unfortunately, sexism primarily only affects women and not men. When will it ever end? Or will it? That is the question that must be addressed by our country if we ever want to be as great as we can be as a country and as a people. The good news is Hillary keeps taking the high road and coming out on top. Time and even more perseverance is the thing, the only thing, that will overcome this gunk. And yes, lots to celebrate. I love Hillary , May she become our president…..